The MPM3606 is a synchronous rectified, step-down converter module with built-in power MOSFETs, inductor and two capacitors. It offers a very compact solution with only 5 external components to achieve a 0.6A continuous output current with excellent load and line regulation over a wide input supply range. 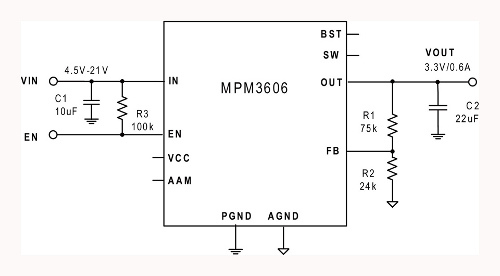 The MPM3606 operates at 2MHz switching frequency, which provides fast load transient response. External AAM pin provides selectable power save mode or forced PWM mode. MPM3606 eliminates design and manufacturing risks while dramatically improving time to market. The MPM3606 is available in a space-saving QFN-20 (3mmx5mmx1.6mm) package. Click the button below to add the MPS 21V Input, 0.6A Module Synchronous Step-Down Converter with Integrated Inductor to your wish list.